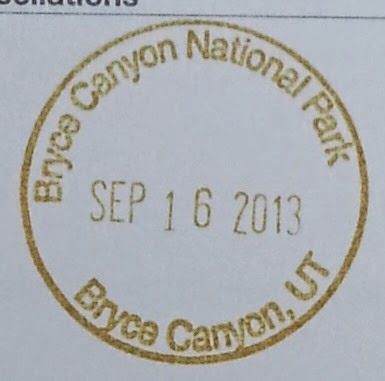 This is NOT going to be a good "review" on Bryce Canyon National Park, by any means. We were only there overnight, long enough for a couple of hikes and then we moved on because we were on a pretty aggressive travel plan. Even though we weren't there very long, we were left with a lasting memory of this awesome place. Everyone should see this. 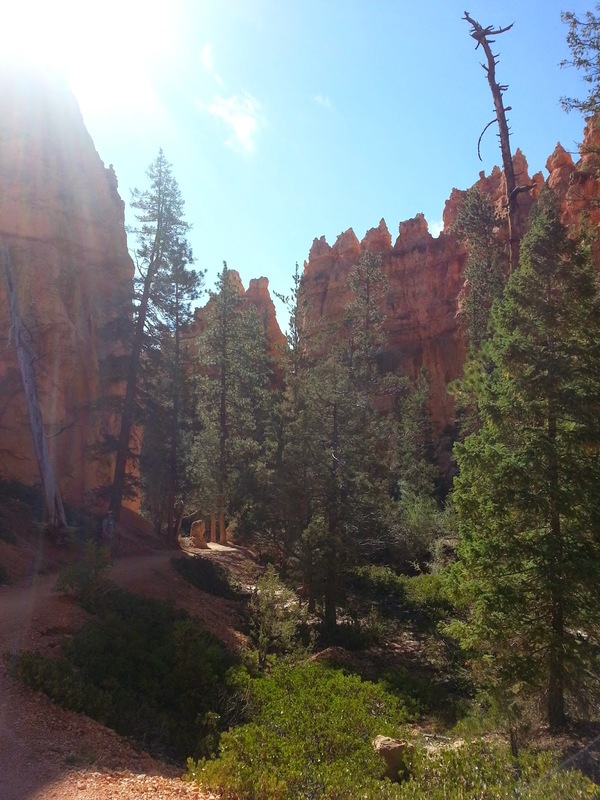 We actually visited Bryce Canyon on September 18, 2013. Our bikes were always the first to arrive! Reds, tans, golds, yellows stretched out as far as we could see. It seemed very much like we were standing in an artificial environment it was so amazing and perfect. I simply could not wait until in the morning when we got our hiking boots on and headed into it to see it up close! WOW! Simply AMAZING! It's like being in the pages of the guidebook we have. When the sun started to set, we watched the shadows spreading across the canyon and it was just so cool. But, our rumbling tummies caused us to decide to load back into the truck and go and find a place to park it for the night. 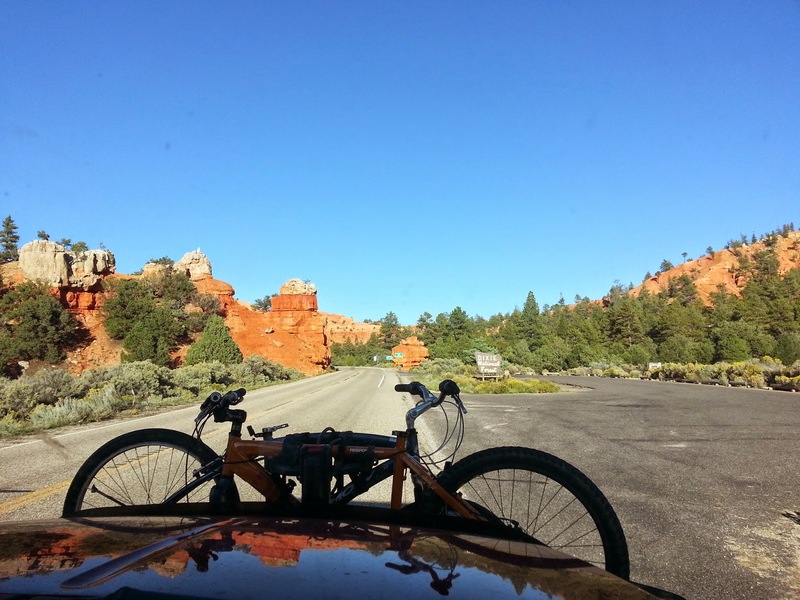 We were sticking to our commitment to boondock as much as possible, though it is much more challenging when you are close to a national park. 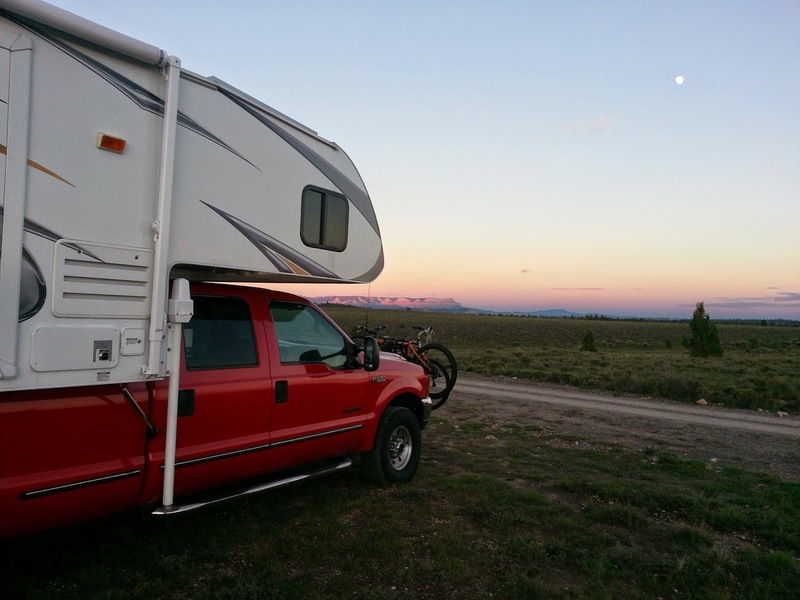 For one thing, boondocking (or overnight parking) is never allowed anywhere on park property. Now, before you feel disgruntled about this rule, imagine what it COULD look like if they allowed this. 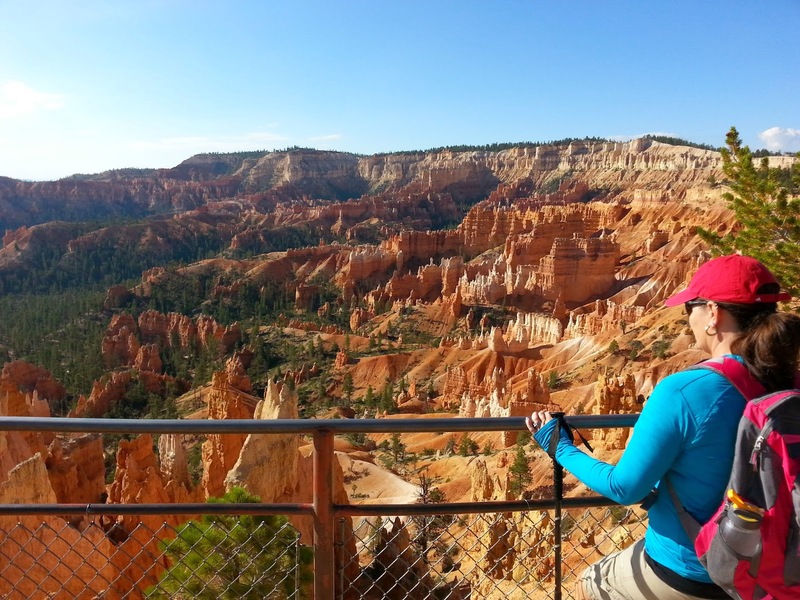 Most national parks have many thousands of visitors every year. If even a tiny percentage of these people camped overnight in common areas, you can well imagine how much it would degrade your experience when you came there. Even if people were clean and respectful (which many are not, as we all know) it would be a calamity. It's a good rule. So we headed out of the park and consulted our map. After not finding anything there that looked promising we consulted our notes, where I had annotated a helpful blog post by a boondocker who mentioned a place of off Tom Best road. We headed that way. I don't know what we did before GPS and the internet. Wow, what a sweet find! We journeyed back on a very passable dirt track that led us back into some desert scrub overlooking a large plateau area. There were quite a few equestrian campers back there too, and we found a nice quiet spot. 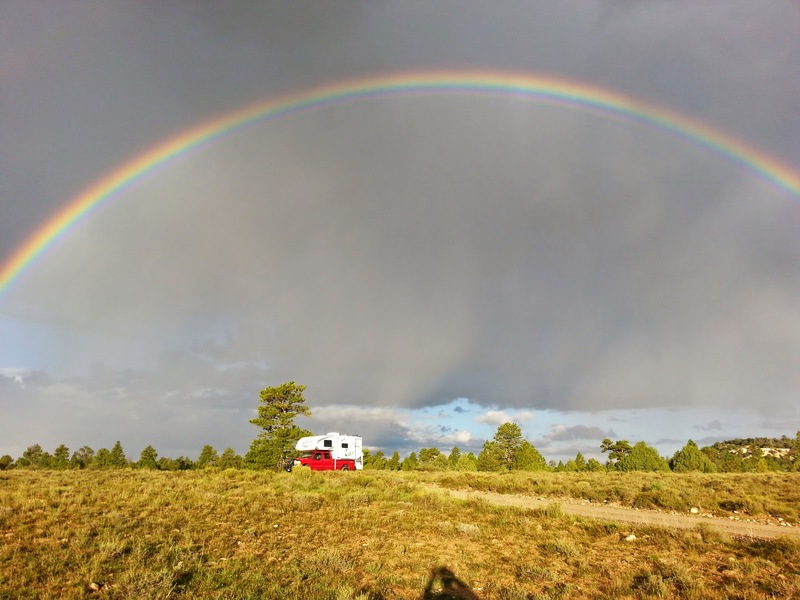 It's well worth the effort to do a little research before your trip if you plan to do some boondocking. Often when you need to find it on the road, you are outside of internet coverage and cannot use your normal online tools. I make an email folder for each destination on our "Big Trip" where we might be spending the night and drop copied blog posts or directory listings in there so that I have them on hand when I need them. As you can see in the photo, we did pretty well. This was not exceptional though. I can say that we regularly find some good spots where we aren't breaking any rules and we aren't bothering any body. We always leave no trace of our visit, and pick up any trash that might be in the vicinity. We practice the good neighbor policy, and you should too. Please encourage others to do so as well, to help keep this fun, exciting resources available for the future! The next morning we had a big, filling breakfast and packed up our backpacks for the days hikes. The air was brisk, but we knew that it would get a lot warmer later on so we layered as they always advise you to do. We filled up water bottles and packed snacks. We were ready! Back into the park we went. The hike was gorgeous. Unfortunately one of the trails we wanted to go on was closed due to a washout the week before, but we still had a stellar experience. 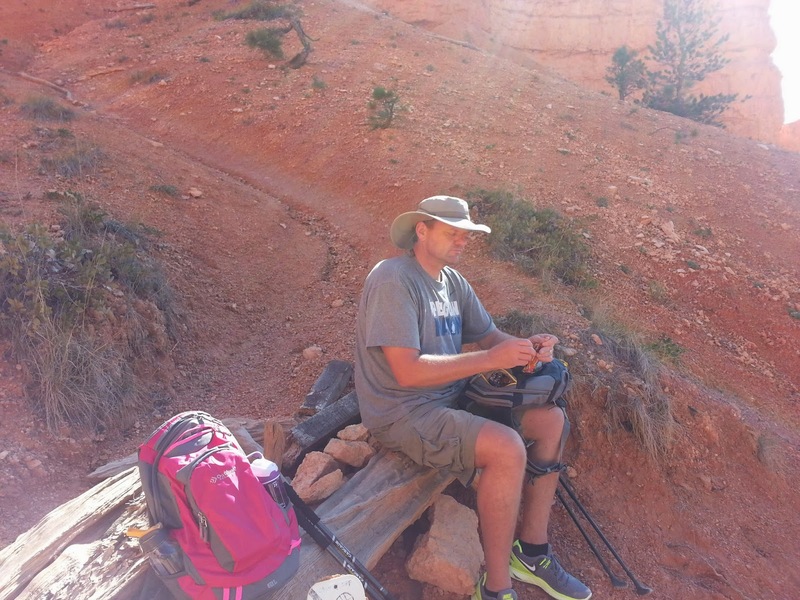 It's a strenuous hike, even though the trail is perfectly groomed. It's a lot of climbing and descending on switchbacks. 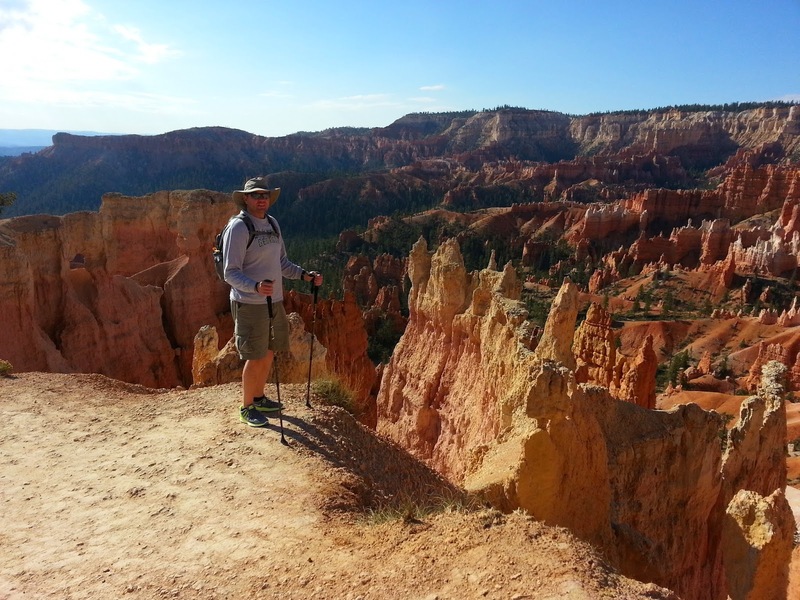 If you have health issues, you would be well advised to choose your trails carefully. There are some scary sheer drop-offs, too, so be careful! Be sure and watch for snakes, I felt like they were all around me, but I didn't actually see one. (I am terrified of snakes unfortunately). We loved our hike, and were truly tired at the end, a day well spent! We began to talk about our next stop, ZION! I was SO excited to go there, and it turns out, I had good reason to be! Stay tuned! Todd takes a break a little TOO close to a cliff for my taste! 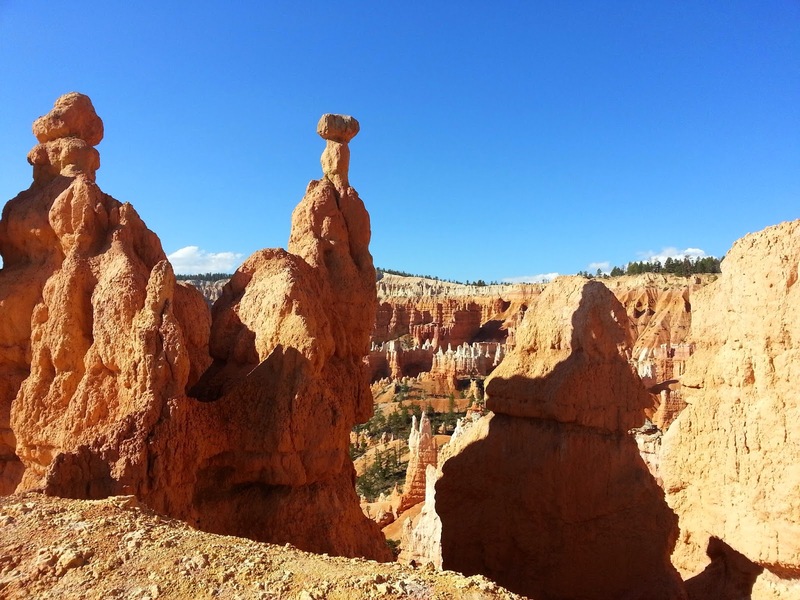 Crazy rock formations are everywhere. Taking a break. It got hot!! Gorgeous scenery was in every turn of your head. I loved the slots and channels along the trail! I can't wait to go back! September is the perfect time to go!